A future version of Minecraft may include quests in the form of achievements. Though over one million people are already enjoying Minecraft, creator Marcus "Notch" Persson and Mojang are still adding the game's final features. In an interview with Gamasutra, Persson said that one of those features could be an achievement system. The basic idea behind Persson's system would be to try to get players to do more in the world than build stuff. The achievement system he has in mind would basically send players on quests throughout the world. "I know a lot of people don't [like achievements], but I like them," Persson said. "I've had the idea to make achievements kind of like the in-game questing. So you'd be able to see the first achievement in a tree of achievements, and you have to unlock the top ones first before you can unlock the ones further down." These achievements might first be awarded for killing a chicken, chopping down a tree, or mining a material. The end of the tree would be a much larger task, like "killing a dragon," Persson added, which could also be used to provide a form of narrative. For clarification, achievements would require Mojang to run its own servers to prevent cheating. If the system is added, Persson hopes that players would want to acquire achievements, and not feel forced into them. As described, it sounds like the way achievements work in Lego Universe, which are basically everywhere in the game and make the world fun to explore. 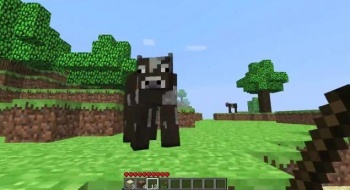 I think we're getting to the point where Minecraft definitely has a lot of potential, but I'd like to start seeing some of these larger features actually implemented. Patience.